Can developing good habits help your kids succeed in school? Yes! Habits are powerful patterns of behavior that automatically unfold in certain situations. 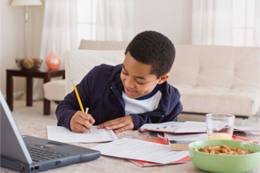 By establishing helpful habits, your kids will have routines that help them succeed in school. The brain loves to establish habits because it takes less thinking and energy. For example, when your children are learning something like how to tie their shoes, it will take all their focus to accomplish the task. Once they master it, their brains will use far less energy as the process becomes automatic. The problem is that your child's brain is just as happy to establish healthy habits as unhealthy ones. Establishing the habit of either reaching for a pastry for breakfast or having a bowl of cereal with fruit is equally appealing to your child's brain. Given how powerful habits are, it is worth figuring out which ones will help your kids succeed in school. "First, there is a cue, a trigger that tells your brain to go into automatic mode and which habit to use. Then there is the routine, which can be physical or mental or emotional. Finally there is a reward, which helps your brain figure out if this particular loop is worth remembering for the future. Over time, this loop - cue, routine, reward; cue, routine, reward - becomes more and more automatic. ... When a habit emerges, the brain stops fully participating in decision making. It stops working so hard, or diverts focus to other tasks. So unless you deliberately fight a habit - unless you find a new routine - the pattern will unfold automatically." Hearing the alarm going off in the morning. Entering the house right after coming home from school. Sitting down at a desk to do homework. Any of these cues can launch a habit. Upon hearing the alarm go off, your children might have the habit of hitting the snooze button or they might have the habit of doing some stretches before getting out of bed. If they're in the habit of hitting the snooze button, they are probably able to do this without really thinking - a bit risky if they want to get up in time! By setting up healthy habits, your kids will be automatically behaving in ways that help them succeed. Let's consider some common routines along with questions about what habits to create. What time do your kids need to get up so that they don't feel rushed? What do they need to get done in the morning before leaving for school? Creating a morning routine chart can help them remember what to do so you don't have to nag. What healthy breakfast food would they like to have available? By the time most kids are in grade school, they can be responsible for making their own breakfast. What healthy snacks would they like to have after school? What type of exercise would they like to do? Where do they want to do their homework? Will they have music playing while doing homework? Will they have their cell phones on? Will they be connected to their friends on the internet? How much electronic entertainment time are they allowed? When will chores be done? What do they need to have done before going to bed? Will they be packing their backpack or lunch for the next day? When do electronics get turned off for the day and where are they stored? Kids who sleep with their cell phones, computers and video games in their rooms have more sleep disturbances. What time do they need to be turning out the lights to get enough sleep? Although they may not always get to sleep at this time, it's at least good to have a target. Establishing healthy habits takes willpower. It's one thing to say that you'll get out of bed at 6:00 AM but it takes willpower to actually do it on a daily basis! University of Pennsylvania psychologists Angela Duckworth, PhD, and Martin Seligman, PhD found that self-discipline and willpower are more important than IQ for predicting academic success. By helping your kids establish good habits using self-discipline, they'll be well on their way to success in school!